My house was the most popular house on the block this week. That’s because I decided to make a different batch of frozen treats everyday. All so you could have something fun for the holiday weekend. I toiled away in the kitchen and gave no thought whatsoever to my hips, freezing and taste-testing five batches of creamy, sweet, cold goodness. Each one got rave reviews, and while it was a close vote, in the end the Chocolate-Hazelnut won by a nut. Tonight’s featured recipe is the flavor that inspired the entire week. Before we get to the featured recipe, what fun things do you have planned for this holiday weekend? What delicious things are you making for your cookout/picnic/get-togethers? I’ll probably take advantage of the predicted good weather to hike and cycle. Maybe even drive up to the mountains. Make the Gelato Plain Base and chill as directed. Make the graham cracker crust as directed and freeze. 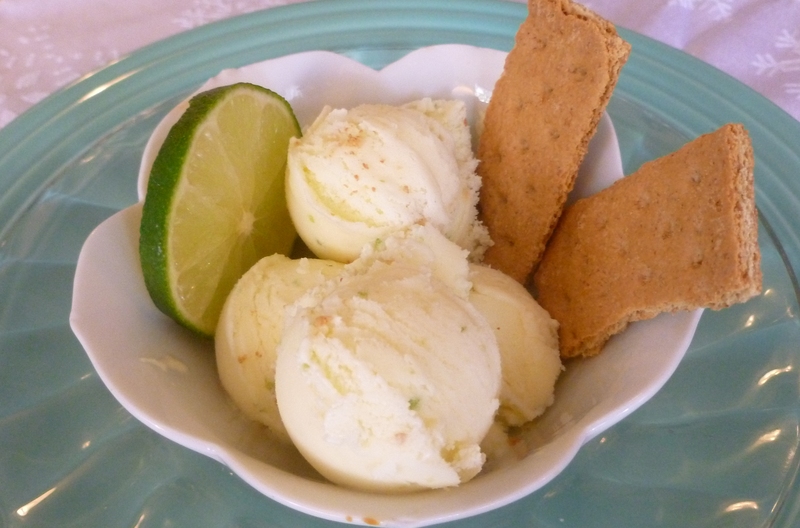 To make Key Lime Gelato: Gently whisk the limejuice and zest into the base. Pour the mixture into the container of an ice cream machine and churn according to the manufacturer’s instructions. Just after churning quickly stir in the graham cracker crust pieces, reserving some for garnish. Transfer to an airtight container and freeze for at least 2 hours before serving. *after you mix in the lime and zest, give it a taste and add more limejuice as desired. If you’re prefer it a bit more tangy, you can add up to 2 more tbsp without worrying about consistency. Note: You can substitute graham cracker pieces if you don’t want to make an actual crust. I just like the buttery flavor and texture of the actual crust in the gelato. For the graham cracker crust: Mix 1/2 cup melted butter, 2 tbsp sugar and 2 cups graham cracker crumbs together. Press firmly onto the bottom of a well buttered 8×8 glass baking dish and bake at 375 degrees F for 10 minutes. Cool and remove from the baking dish, break into bite-size pieces and freeze in a covered container. In a heavy-bottom saucepan, combine the milk and cream. Place over medium-low heat and cook, stirring occasionally so a skin doesn’t form, until tiny bubbles start to form around the edges and the mixture reaches a temperature of 170°F. Meanwhile, in a medium heat-proof bowl, whisk the egg yolks until smooth. Gradually whisk in the sugar until it is well incorporated and the mixture is thick and pale yellow. Temper* the egg yolks by very slowly pouring in the hot milk mixture while whisking continuously. Return the custard to the saucepan and place over low heat. Cook, stirring frequently with a wooden spoon, until the custard is thick enough to coat the back of the spoon and it reaches a temperature of 185°F. Do not bring to a boil. *The best way to temper is to add a tablespoon at a time until you’ve added about 1/4 cup. Then you can add a full ladle at a time, slowly. One final note. If you’re wondering what the difference is between Gelato, Sorbet and Ice Cream, click here for a pretty good explanation.